Zi Sidlo: (1971 - Present) Army brat, culinary artist, tumor survivor, hedge witch, and huge lover of shih-tzus and ferrets. She is currently working as a full time caregiver to her 71 yr old father, retired Army, 24yrs. Born in Wisconsin, Zi spent her young life traveling with her military family, and finished her high school & college (Culinary, CNA, Art (focus in clay, woman's history, Goddess history)) in the United States. She enjoys composing in-depth stories about family & fantasy. Her mother's side of the family was involved with paranormal situations, family gatherings, crafting, and the deep love of food. Zi had been drawing, writing, and composing since she can remember. 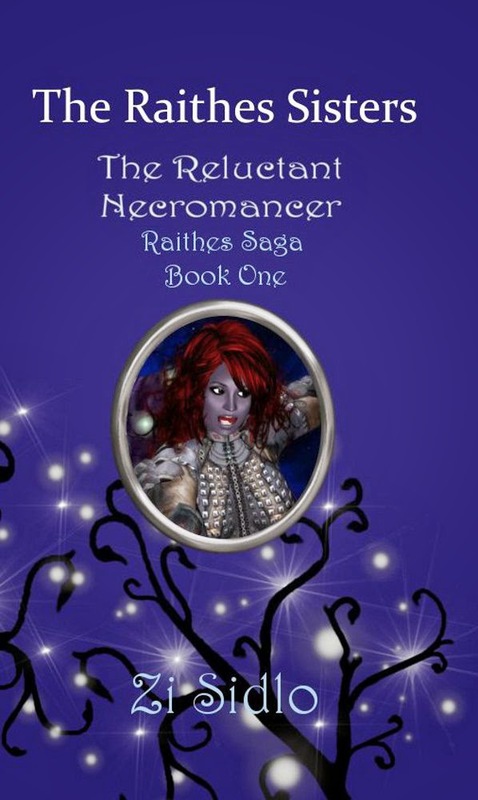 The Raithes have been known since the beginning of their underground city as the masters of the Dead. Neruda has always decorated them with prestige. Over time, the bloodline's magic ran dry, loosing the respect as power is paid for in potions. The Raithes hold onto an aging house in what has been declared the lower of the three royal districts. With the births of two daughters, magic rushed back into the dying family name, much to the disbelief of many. Will the daughters be able to hold onto the family rights without a male heir? Magikagotessa feels she is the rightful heir while her elder sister, Dunkleagthae, inherits the troubles along with the estate. Can they find common ground while breathing life back into what made the Raithes what they once were? The cleric stood there in her powder blue hospital robe, her white hair pinned up, waiting for a response as Dunkleagthae sat there, watching the couple before her who had once been her parents. Gone was the prideful strut from her father. Gone was the controlled powerful beauty her mother had once commanded. Before her were the broken shells of two dark elves. The red armored guards stood ready as well as a wizard in a dark black robe. The wizard's markings showed his high ranks. He was simply there to help control their ‘patients’ as he had put it. The young Grey Knight had no idea how to reply to the cleric or the others around her. The necromancer couple stayed close to one another, seeming to only know each other in their new found madness. Dunk could not believe what had transpired. How could this have happened? Her chances for freedom had been shattered with this new twist in events. Her parents had gone to war, serving, as they should. They, and several other Necromancers, went to fight for their homeland. As they should have. Naturally in battle, they were attacked. Yet, the damage done to them was unspeakable – all of the casters in their troop had somehow been made insane. Why they were not killed? ‘Ever try to kill an insane necromancer? It is easier to tend to them and find a cure. If a cure exists.’ had been the cleric’s reply. Ten years? She blinked at the cleric in disbelief, “How am I to tend to things while they are ... are...” Dunk was feeling her self-control was slipping away. The cleric now shot a rude glare at him. The wizard sighed heavily, finally saying, “Oh, right, add more to the mess. Well you could talk to a friend of mine who managed to avoid getting infected. His name is Lord Bloodrail. I’ll give you a scroll to hand to him. If anyone can help you, he may be the one to do it. He was someone Lord Raithes looked to as a reasonable equal. I’m sure it may lead to a better arrangements.” Dunk nodded, silently wondering how many others this wizard was sending to this mysterious lord.